A direct descendant of Robert the Bruce, King of Scots for nearly a quarter of the 14th century, Bruce is an expert on 20th century protocol. 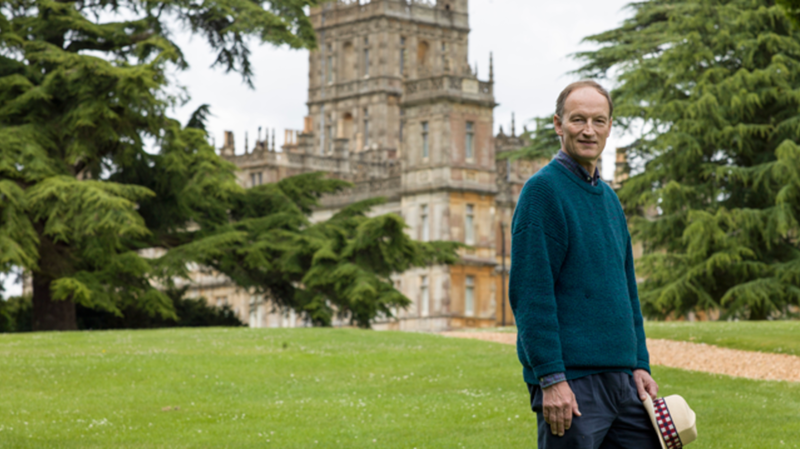 He has spent the past five years making sure that every detail of Downton Abbey is exactly as it should be. Better known on the set as “The Oracle,” we spoke with Bruce about painstaking research, perfect posture, and what might be in store for that naughty Lady Mary. MF: How and where did your interest in the history of this time period begin? AB: I’ve always been interested in courts and how power works and how there is always some sort of performance around the delivery of power. In a sense a great king makes sure that he is surrounded by rituals and utilitarian processes by which his position is enhanced and elevated in amongst the people that he lives, because if you are king you need to be elevated. The whole subject of studying the courts of England means that you know something about how the aristocracy of England works, because the aristocracy of England followed what the courts did, but did it at a slightly reduced scale. Therefore you can almost trip over a very considerable knowledge of how these houses [like Downton Abbey] worked. In addition to that, I’ve always enjoyed primary research into letters in particular and also accounts, which give you such a wonderful insight into tiny details that might get referenced in a housemaid’s letter to her mother or a father’s letter to his new hall boy son who is just starting in the big house. They communicate things that are detailed, which are almost irrelevant to somebody who is not interested, but to me it can unwrap and embellish a whole area of misunderstanding that I had. And when the director turns and asks, “Alastair, should they do this or that?,” it helps me come up with a coherent and absolutely clear answer then and there. MF: So where do you begin? Where do you go to look for letters and account books? AB: Well, families keep letters… And some families are very wise and find those letters from their great uncle and, rather than chuck them in the bin, they hand them into libraries. They are quite difficult to find, but I now know all the roots. It’s the same with you: You want to know something and, because you are a journalist, you find routes through which to discover what it is you need to know. I’ve learned the tricks of how it works. But the other thing is the account books, and very often our county archives are stuffed with the most extraordinary stuff. You can find, for instance, the wardrobe accounts of an old stately home of an aristocrat from the Middle Ages, which is just as interesting as the household accounts run by people like Mrs. Hughes. Imagine the account book in your office: The account book for five years ago probably had a huge amount of money being spent on paper. It now has a much reduced amount of money being spent on paper. A historian in 30 to 40 years’ time is going to find that fascinating if they don’t already know why we suddenly reduced using paper. The account books will tell that story. I always find that when I’m trying to explain it to people who are desperate to write things that will be deeply interesting it sounds so tediously dull, but it really is fascinating and wonderful because when you are actually holding the letter that was written by the housemaid in 1912, when she started her new job and her new position, and she is writing to her family. She has no telephone—there is no other way of communicating with them—so they write in such wonderful detail. Often they are not well educated, but they still write beautiful letters, which are eloquent narratives of the world she finds herself in. This is a girl writing to her mother or father and just saying “I’m sitting in” and then she describes the room. Then she says, “The butler is like this” and “we have to get up at this time”. And there it all is! It’s fascinating. MF: How did you become involved with Downton Abbey? AB: That’s much easier to explain. When I was a child I went to lots of children’s parties, because that’s what we all did in the countryside in England. One of my great friends is someone called Emma Kitchener. She descended from Earl Kitchener of Khartoum, or Lord Kitchener as he was known, who had been a great Secretary of State for War in England at the beginning of the First World War. Emma and I used to dance together a lot. And then, she married somebody called Julian Fellowes. Julian was asked to write a children’s TV adaptation of Mark Twain’s wonderful story, The Prince and the Pauper. And in so doing he had to stage the coronation of King Edward VI. You probably know the story—a prince changes place with a pauper in Tudor, England—and so we had to create a coronation. And I am an expert, oddly, in English coronation ritual. And Emma said, “Julian, you must get Alastair to come and help you out with this,” which I did. And we have never looked back. MF: Did you work with him on Gosford Park as well? AB: Well, I would like to think that I contributed to almost everything that he has done. Obviously how he worked at that time was writing largely in his trailer as an actor on a TV show, Monarch of the Glen, which may not have been successful in America. He played the part of a Lord actually, but I think he didn’t academically find it very challenging and he sat and wrote Gosford Park in the spare time that he had. And off he went to get an Oscar and life was rather altered. I helped him with The Young Victoria as an historical advisor and I then went off to do The King’s Speech and then to Downton Abbey. And I’ve been working indirectly helping on a TV show which is coming out quite soon called Indian Summers, which is all about British power in India and the conclusion of that story in the 1930s. So I’ve been helping and that is coming out in Britain very soon and it’s coming over to America soon after that. MF: Your title within the show is “Historical Advisor,” but your job really goes far beyond that. How does your role within the show work? Are you mainly working with the team while the series is in production, or are you doing work while they are writing, too? AB: Julian writes the script on his own and he works with the executive producers and the producers in shaping the story and getting all of the detail right. Every now and then, because Julian and I are very great friends, on a less formal footing we do discuss a great deal of the storylines that he has planned. I’d like to say that I am pretty much in the know of where he wants to take the story in this coming series, which is already doing very well in its written form. He delivered quite a few scripts for series six and in fact I am looking at four episodes right now in my briefcase as I go off for the weekend. So we are well ahead with all of that. But as for my role: Two days ago I was with the costume department and the hair and makeup department discussing esoteric things about the new series. MF: Is there one scene or episode that stands out to you as being particularly challenging in terms of choreographing all of the behavior and details? AB: I think the one I’m most proud of is when Lady Rose is presented at the court of King George V and Queen Mary at Buckingham Palace. It was the Christmas Special last year. Why I love it and why I think the elaborateness of it sits so comfortably is that in order to prepare it, Julian obviously wrote what he wanted to write, we collaborated very much. And I went off to Windsor Castle and burrowed around in the archives at Windsor Castle and found the very papers referring to the 1923 court that we were purporting that Lady Rose had been presented at. I found the actual document. They brought it on this trolley—a filthy, dirty file, as all things are. You don’t become an archivist and expect to keep your clothing tidy—it was just fantastic to go through the detail. For instance, we found the very music that had been chosen by the King for his band to play while the court was going on, so we reproduced it. There was the positioning and the laying out of where everybody was, who was there, and what they were wearing and to a T we reproduced that. I was so thrilled with it I asked if I could actually play a part in it because it put me in the center and I could keep my eye on what was going on. And they made me the Lord Chamberlain; I read out the names for each of the debutantes going to be presented. MF: Which must have made it easier to correct their posture as they walked by. AB: I am a great one for making sure posture is right. And it’s not because I am just being tedious. It’s because in those days they really did stand in a different way than we do now. MF: In The Manners of Downton Abbey special you talked about how nannies would put knives against the backs of a chair so that children wouldn’t slouch back. That chair backs were really meant to be decorative only, which was fascinating. AB: You know it’s so funny that you mention that castaway line in the film because it has become a major point that I have made. And I can understand now that it was always very natural to me because it was my mother who told me about the knives; that had happened to her. Then I asked other people and they’d had it, too. It wasn’t a great big carving knife stuck straight into the back, it was a sharp and pretty uncomfortable knife that you couldn’t lean back on. It was just strapped into position. And it taught young women who were leaving the nursery or about to leave the nursery and getting ready to go downstairs to eat with their parents to sit up straight and how to hold small conversations. I mean a lot of people now can’t communicate unless they are holding their mobile phone, but in those days young ladies and gentlemen were taught how to hold a conversation with anyone. MF: Is there one specific behavior you feel you have to correct most often, be it a speech pattern or something posture-related? AB: Yes. I call it “crotch-grabbing,” which sounds much worse than what it is. But if you imagine somebody standing in front of you now with their hands clasped in front of their private parts, it’s a sort of natural way in which a lot of men and women who a little bit self-conscious stand in repose. And the way that they can do it is because in the last 30 or 40 years in Britain—it may have gone on longer in America—people’s shoulders have fallen forward. If you were to lift up your shoulders, put your back further back and then down on your spinal cord, and lay your shoulders so that your shoulders are back, your chest is out, your stomach is in, and your neck is up, it is impossible to put your hands across to hold your crotch. If people stand correctly they can’t do it. It’s a modern way of standing and I don’t enjoy it. I don’t win every time, because there is so little time to get everybody organized and concentrated, but I do believe that we have just about kept most of the actors from doing that. And I don’t like people putting their hands in their pockets because pockets, in those days, was sewn directly upwards, sort of south to north on the trousers rather than at an angle, like with Levi’s. Which almost encourage you to put your hands in your pockets. MF: The show likes to poke a bit of fun at Cora for being an American. At the time would marrying an American have been frowned upon or less desirable? AB: Not really. It was a target for some of these families. They were desperate to marry an American because as the agrarian economy was declining in Britain, the Industrial Revolution had moved the generation of wealth from the countryside to the towns. So these great stately homes were increasingly cast off from the chance of being financially self-sufficient. So what did people do? They noticed that there was a social aspiration in America, not least amongst those robber baron-type families who had made quantities of money that are beyond comprehension on the East Coast who were looking for some sort of social handle against which to balance their massive financial achievement. And over in Britain was a plethora of social status in the form of the aristocracy of the United Kingdom and very little money. So a marriage of convenience, literally, was sort of conspired by a large number of families. Perhaps one of the best known was Jenny Jerome, who married Randolph Churchill, and their son Winston Churchill went on to become such a tremendously important war leader for both America and Britain. But Jenny Jerome, Churchill’s mother, was a wealthy American who married a pretty impoverished aristocratic man who needed some money. Just as [Charles Spencer-Churchill], who was the Duke of Marlborough, had married Consuelo Vanderbilt. All that money from the railroad charging into the center of Manhattan was in her corsage as she set off to Blenheim Palace. If you go to Blenheim Palace you will see this building that was basically restored, maintained, and given life by the money of Vanderbilts. So it was a marriage of convenience. MF: The Ladies of Downton—Lady Mary in particular–have engaged in their fair share of scandalous behavior, some of which has been discovered. What would have happened if a Lady’s reputation was sullied? How would a family deal with that? AB: Well the family will deal with it. I am not going to second-guess at what may happen in the story, but if it had happened in my family—and I think it happened in most families of that period because women were desperate not just for themselves, but the whole generation that they had seen die in the First World War, so they were living this sort of life for every memory of a beloved childhood friend who was no longer with them. They were absolutely determined to live and not be tied and constrained. But how would families deal with it? Well they would try and shut the whole thing up and make sure nobody knew that a blemish outside the careful, cautious footsteps of moral perfection had been trod. And they did this with exceptional care. There were two things that would help aristocrats: First of all, they were in a position to shut people up. And the staff wouldn’t mention it if they knew, because why would the staff blab about the daughter of the house? It would bring discredit upon the house, and discredit upon the very business that they had dedicated their lives to be a part of. It’s like working for a well-known company and something goes wrong in the company and letting the fact that something has gone wrong in the company out of the bag. In the end, it reflects on you. People will say, “Oh, you were in that company that something went wrong in.” So that shut it up. When Lady Mary decided to go and have this tryst with Lord Gillingham, she knows the roulette wheel is spinning. And the moment she decides to open the door to that dashing young man with all the fervent excitement that must have been coursing through her veins at the need after being a widow for as long as she had been, and after having being brought up in that constrained way, to be enveloped in his masculine arms... All of that—which is so human and natural—is being tempered by that lovely line that she uses when it is proposed to her: “If my father was here he’d pop you on the nose.” And when she says it, what she is saying is, “You are suggesting something absolutely outrageous. But deep down inside I’m in such a confusion. What could possibly be lost, because nobody will ever know?” The belief is always that nobody would ever know. This is a very contemporary thing, too. MF: The Manners of Downton Abbey, the special you hosted, makes it seem as if all of this is just second nature to you. Do you still do a lot of research or is a lot of it second nature at this point? AB :I think that a lot of it is second nature. But what is interesting is that it most definitely is not second nature to the actors or to the directors, which you might think it would have become. After all we get a new director very often in for each new series. At the moment I am working with a director who did two blocks in the last series, but I am about to meet a director who hasn’t filmed with us at all and I literally have to sort of start off by asking, “What is a footman?” But there is always further research to do and I am always keen to get more information. I simply can’t afford to not have all the answers, because the way filming works is that we have got to produce four-and-a-half minutes of film a day. A day is a very long day, and you understand we’re all nearly dead at the end of it. But in that four-and-a-half minutes, which sounds like it is not much to produce, we are frantically trying to make sure that we keep schedule. When the director and the actors are bringing Julian’s script to life, the last thing they need is an historian who is going, “I’m not sure whether you should go through that door. Hang on, I am just going to go and check something.” I have to know. There is absolutely no room for me not to know. And on the whole I do not hold them up for a millisecond.